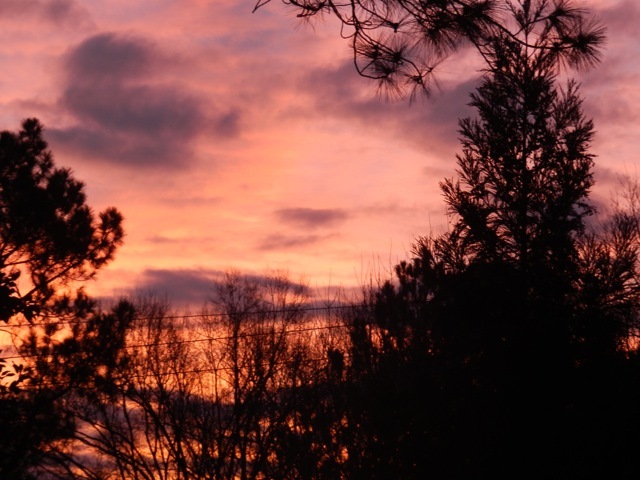 Thank you Mary Lee for the beautiful sunrise in Charlotte! ★~ Today’s Quote: The Snowdrop, in purest white array, first rears her head on Candlemas day. Today is one of the “cross-quarter” days and marks the midpoint between the winter solstice and the vernal equinox. South of the equator, of course, it’s the exact opposite. In many traditions it is considered the beginning of spring. It’s the dawn of the year. It’s the time of germination. “Now is the time of stirring when the earth begins to soften and the waters to flow, while frost still bites & winds blow,and the light is growing stronger, and life begins to wake. This is the feast of Brigid, the goddess of fire & water. She is the year’s midwife who births the sun. Through the union of fire & water, the ancients, our forebears, worked magic to call in the spring, So let us join together as one folk to make our offerings in joy and reverence. For all that dies shall be re-born.” Thank you, Hazel! Celebrate today by lighting candles, cleaning your home, planting some seeds (if the ground is warm enough), or starting something; Candlemas is a time of new beginnings. Light a fire and toast some marshmallows; allow your spirit to shine brightly. So how much longer is winter going to last? 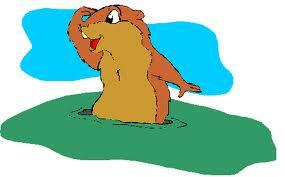 Only ground-hog Punxsutawney Phil knows the answer to that question! He has been making predictions since 1887. According to legend, if Phil sees his shadow (a sunny morning), there will be six more weeks of winter. He then returns to his den and goes back to sleep. If, however, he does not see his shadow (a cloudy morning), spring is just around the corner. For the record, Phil sees his shadow about 9 out of 10 times. The French call Candlemas Chandeleur, Fête de la Lumière,* or jour des crêpes. 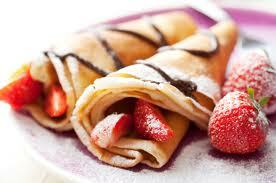 They celebrate Chandeleur by eating a lot of crêpe, and they also do a bit of fortune telling while making them. It is tradition to hold a coin in your writing hand and a crêpe pan in the other, and flip the crêpe into the air. If you manage to catch the crêpe in the pan, your family will be prosperous for the rest of the year. If the crepe falls on the ground, I predict you will yell “oh, crap!” and the dog will prosper. If you don’t want to flip crepes, there is another option . . .
My menu plan this morno included heavenly hash browns for breakfast. But then I learned that heavenly hash was a dessert. Really? What about hash say’s dessert? 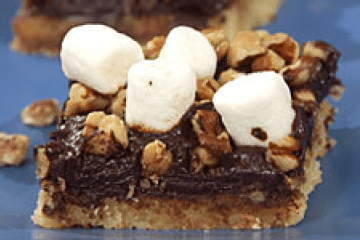 Although I have to admit these heavenly hash bars look pretty good. ♥~ 1993 – The U.S. issued patent #5,182,823 to Ron Alsip of Raynham, Massachusetts, for his Toilet Seat Clock, a toilet seat with a clock built into the space normally between one’s legs while sitting on the toilet. 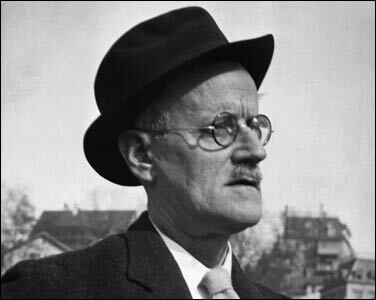 ♥~ 1882 – James Joyce poet, author: once said, “The demand that I make of my reader is that he should devote his whole life to reading my works.” Joyce wrote Ulysses (1922) and Finnegan’s Wake (1939); an autobiographical novel, Portrait of an Artist as a Young Man (1916); and a short-story collection, Dubliners (1914), among other works. He was educated by Jesuits, first visited a prostitute at the age of 14, dropped out of medical school and aspired to be an opera star. He met and fell in love with a Galway hotel maid named Nora Barnacle when he was 22 years old, and he set the action of Ulysses on the day he had his first date with Nora, June 16, 1904. It’s now commemorated all over the world each year as Bloomsday, after the novel’s protagonist, Leopold Bloom. Joyce liked to drink and he liked to dance; his daughter-in-law said that “liquor went to his feet, not head.” He usually sat with his legs crossed with the toe of one crossed again under the calf of the other. He was kind and generous to strangers, and he was known to invite waiters to join him at his table for food and drink. His friend, Sylvia Beach, proprietor of Shakespeare and Co., said that Joyce “treated people invariably as his equals, whether they were writers, children, waiters, princesses, or charladies. What anybody had to say interested him; he told me that he had never met a bore. ♥~ Phil the groundhog’s full name is “Punxsutawney Phil, Seer of Seers, Sage of Sages, Prognosticator of Prognosticators and Weather Prophet Extraordinary.” It was so proclaimed by the “Punxsutawney Groundhog Club” in 1887, the same year they declared Punxsutawney to be the weather capital of the world. ♥~ For most of the year, Phil lives in a climate-controlled home at the Punxsutawney Library. He is taken to Gobbler’s Knob and placed in a heated burrow underneath a simulated tree stump on stage before being pulled out at 7:25 am on Groundhog Day, February 2, to make his prediction. ♥~ Phil is reputed by townspeople to be more than 100 years old, surviving beyond a marmot’s normal life span thanks to the strong constitution of his wife, Phyllis, and a steady diet of Groundhog Punch. El Morno is confusing today, isn’t it? I’m confused and I wrote it. Well, I guess the good news is that we don’t have to celebrate the day skyclad. I really prefer days when we all stay fully clothed. Fellow blogger, Mary Lee worked out in the yard yesterday preparing for spring, so I think we should see if we can talk her into trying to flip crepes today. It will either be her dearly beloved’s or Miss Piggy’s lucky day. I’m thinking about skipping the crepes, skipping the hash browns, and heading to Lone Star steak house for a blooming onion! I think they even have candles on the table. If you have a morno moment, leave a comment. I have always liked that groundhog and with all the mild temps out there nobody is going to be too mad at him today if he see’s his shadow. Never heard of hash as a dessert. I like your idea of dinner at Lonestar! I like Punxsutawney Phil too! He is a little on the large size but otherwise seems like a fine ground hog. With all those TV spotlights on Phil, he’s bound to see his shadow! And, despite the warmth we’ve been having thus far this winter, I’m waiting for the other shoe to drop (we have to get a certain number of degree days in before spring). I just know winter’s going to be so much more cruel when it finally gets here! Sheesh…aren’t we just Debbie Sunshine today :-D. I just can not even believe you are doubting Punxsutawney Phil, Seer of Seers, Sage of Sages, Prognosticator of Prognosticators and Weather Prophet Extraordinary. Thanks for the additional information! I would never be able to come even close to explaining these holidays without you!